Junior guard Yuta Watanabe defends a Saint Louis guard during their game on Saturday. Watanabe scored nine points and grabbed nine rebounds on the night. After trailing by 13 early and scoring only 23 points in the first half, it took men’s basketball all game to climb back into contention Saturday afternoon. Saint Louis sunk its first eight shots, including five three-pointers, forcing the Colonials to play from behind from the get-go. GW trailed for more than 34 minutes of the game, but eventually scrapped their way to a two-point difference down 53–51. A difficult shot in traffic by graduate student guard Patrick Steeves and the game’s biggest three-pointer from redshirt junior Jaren Sina gave the Colonials a three-point advantage with two minutes to play. 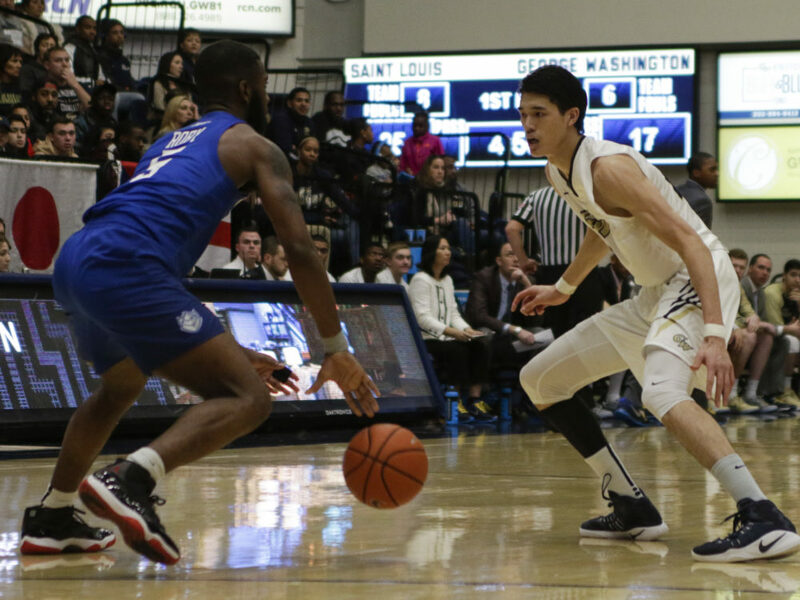 Although the Billikens (6-15, 2-7 A-10) were able to get several more attempts at the basket, they never regained the lead as the Colonials (11-9, 4-4 A-10) went on to capture their third straight league win, 63–55. 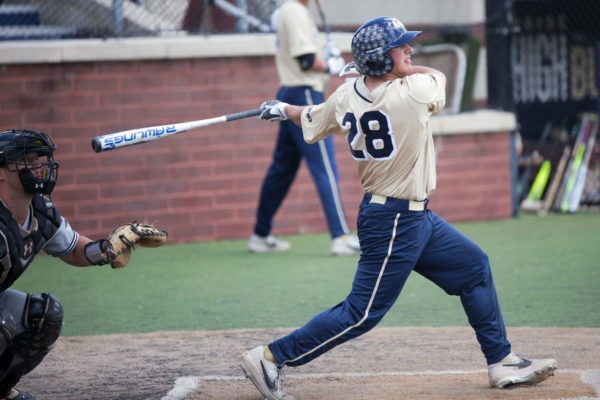 The win moves GW to .500 in conference play, which brings them within two games of first place with a little over a month left of the regular season. Graduate student forward Tyler Cavanaugh led the way in scoring for the Colonials with 18 points and 6 boards. He sunk two big three-pointers during a night in which GW did not shoot well from behind the arc as a whole. Steeves also had an impressive outing, scoring a season-high 13 points, including five second-half baskets when the game was on the line. Saturday was the second game in a row that the Colonials have limited their turnovers compared to their season average. The team only combined for four giveaways in the second half, assisting in the comeback. The Billikens got off to a better start than anyone could have expected. The visitors did not miss a shot for the first seven minutes. During that run, Saint Louis was able to build up a 21–8 lead and the GW defensive effort looked like it had no chance of stopping them. As the game progressed, the Colonials defense improved drastically. For a six-minute stretch, the Billikens did not make a basket, missing six consecutive shots and succumbing to a shot-clock violation. During that span, GW did not make up much of a difference offensively. The Colonials shot only 31.8 percent from the field in the first half and went 2-for-11 from three-point range. In the final two minutes before the half, Steeves hit two free throws to cut the lead down to single digits. Then, sophomore guard Jordan Roland knocked down a three to make it a two possession game at 29–23 at the break. For the majority of the second frame, the game was back and forth. Neither side was able to mount any runs, so Saint Louis maintained the lead for almost 13 minutes. With just over seven minutes remaining, GW scored five unanswered points, capped off by a left-handed, game-tying layup by Cavanaugh. The Smith Center crowd was shortly silenced as Billikens guard Davell Roby swished a three-pointer. But, the very next possession, Roland responded with a three of his own, making it 49–49 after an offensive rebound. After Sina and Steeves gave the Colonials the momentum and the lead, Saint Louis began to foul to stop the clock. Although GW missed two free throws, the defensive effort was strong enough to keep the ball out of the basket in the final minute. The Colonials will return to action Tuesday when they travel north and take on Rhode Island. Tip-off for that game is scheduled for 7 p.m.